How to Build a Hug, Temple Grandin and Her Amazing Squeezing Machine is a wonderful book to raise awareness of Autism. As a fan of Temple Grandin’s work and mission, I was excited to find this book at my local library written by Amy Guglielmo and Jacqueline Tourville. As a young girl, Temple wanted to be held but didn’t like hugs. The books takes you through the young life of Temple Grandin who loved folding paper kites, making obstacle courses for her dog and building lean-tos with real hinged doors. She didn’t like scratchy socks, whistling teakettles, bright lights or smelly perfumes. The book accurately describes to the reader the challenges that Temple went through with regards to her sensory over-stimulation in a simple and descriptive way that all children can understand and sympathize with. This is important because part of acceptance and empathy is understanding another person’s perspective. As Temple gets older, she attends a school that helped her excel in art and science and learn to horse back ride. Temple desperately wanted to love hugs because she craved that social closeness. At her aunt’s ranch in Arizona, she discovered a machine for cows that would help them calm down by providing pressure. She had an idea! She can create her own hug machine in the way she wanted! After a lot of hard work, Temple finished her hug machine. When she crept inside of it, “Temple smiled. The loud noises disappeared. The air smelled fresh. And the bright sunshine felt wonderful.” At the end of the book with the help of the hug machine, she learned to enjoy real hugs from her own family, which she treasured. As a speech language pathologist that has worked with both children and adults with Autism for almost 20 years, I have seen first hand the various sensory issues that accompany Autism. I loved how the authors explained Temple’s sensory issues in a way that both children and adults can understand. I also liked the way that the story is told and how she learned to find comfort when feeling overwhelmed. The hug machine she created provided a safe and peaceful place for her and also created a wonderful therapeutic tools for others that can benefit from the hug machine. Temple didn’t sit back and let it take her over, she initiated a solution which is a strong message for anyone with Autism. As you reading this book to your child, explain the feelings and emotions that Temple felt when she wanted a hug but felt uncomfortable. What did it feel like when she discovered the hug machine? How did she feel when she was in a loud classroom and how did she react? This is important information for all children to know because with knowledge, comes understanding. I think every classroom should have the opportunity to learn about Autism. 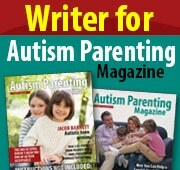 To learn more about Autism Awareness materials that are available on TeachersPayTeachers, click here. To learn more about Temple Grandin, check out my article here. Read the review of her children’s book, Temple Did it and I Can Too! Seven Simple Life Rules.